If you haven’t figured out how to make good use of your excess beet greens, or are looking for a new green to work into the rotation, this smoothie is for you. Beet greens blend well, aren’t overly bitter, and offer some nice health benefits. They are rich in vitamin A, think improved vision and stronger immune system, and vitamin K, which when combined with calcium produces strong bones. 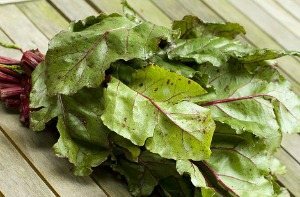 Beet greens are also a good source the following vitamins and minerals: vitamins C and E, calcium, iron (more than spinach), copper, magnesium, manganese, and potassium. Like spinach and chard, beet greens have a rather mild flavor, so don’t worry about your smoothie being too bitter, especially if you include a sweet fruit or two. As a milder green you can often hide the presence of beet greens in a smoothie when serving the particularly discerning, such as kids and green smoothie newbies. Now toss those beet greens into your blender and make a healthy green smoothie! Combine with apple, blueberry, banana, cinnamon, an add-on(s) of your choice and you’ve got yourself one delicious and nutritious smoothie. Enjoy! Please leave a comment below if you try this tasty apple blueberry beet greens smoothie. Happy Blending! I made this smoothie this morning and it was AMAZING! I had to omit the banana bc I’m allergic and I used vanilla plant fusion protein powder. I also added a little maple syrup. I love beets but never thought of using the tops in smoothies. So glad I found your recipe. If you have any other recipes it would love to try them as well. Sorry to hear you and your husband didn’t particularly like this recipe. Everyone prefers a slightly different consistency, which presents a challenge when posting recipes. And some blenders aren’t powerful enough and require a little extra liquid. I almost always use frozen fruit, which provides enough thickness for me. Typically you can simply adjust the amount of liquid a recipe calls for to achieve your desired consistency. If you like extra creamy smoothies, avocado is advised. Your husband might not appreciate the healthy smoothies you’re “pushing” on him right now, but he will some day. I would actually maybe try this one again with less water. I usually don’t add very much liquid to my smoothies, as my Ninja Ultima does a super job for my needs! May I ask what kind of blender you use? I always add at least 1/2 cup of ice to mine too. When I first started posting recipes on my site I had an Oster Beehive, which required a little more liquid. I’ve since purchased a Blendtec, which pulverizes everything. Keep leading by example and he’ll come around eventually!